The Alumni Community Service Award is given annually to an alumnus or alumna who has demonstrated distinguished leadership and commitment to serving the community in which they live or work. The award is designed to recognize the values of service and civic responsibility that are fundamental to the Bates education. Bates’ Bests are awarded annually to dedicated alumni volunteers who express a passion and commitment for advancing the mission of the college. The Benjamin E. Mays Medal award was established during Mays’ lifetime, and he was the inaugural recipient of the award in 1982. 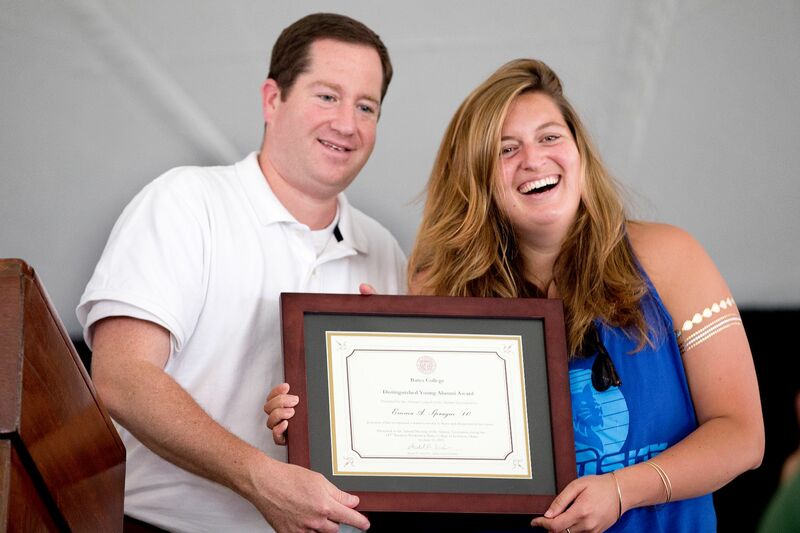 This is the highest alumni award of the College to honor the alumna or alumnus who has performed distinguished service to the larger (worldwide) community and been deemed a Bates College graduate of outstanding accomplishment. It is an occasional award that has been made only 15 times. The Bruce Stangle Award for Distinguished Service to the Bates Community was established in honor of Bruce for his decades of remarkable service. It is an occasional award that will be given in recognition of Bates leaders whose body of work has touched countless Bates people and helped them become better professionals in their careers or in their volunteer work. Established in 1987, the Distinguished Young Alumni Award is presented to a young graduate (usually not more than 15 years out) for exceptional volunteer service to Bates and distinction in his or her career. Inaugurated in 1981, the Helen A. Papaioanou ’49 Distinguished Alumni Service Award is awarded to a graduate or graduates (usually greater than 25 years) for truly distinguished service — both in quantity and quality. Historically known as the Distinguished Alumni Service Award, the 1999 award was renamed the Helen A. Papaioanou Distinguished Alumni Service Award, to honor Helen Papaioanou, M.D., class of 1949, for her decades of service to Bates and to the board of trustees from 1965 to 1999. The Sesquicentennial Prize was established in 2005 in honor of the college’s 150th anniversary. It is awarded to an alumna/us for a single academic, artistic, or scientific achievement. It is conferred at the discretion of the Alumni Council. This award is given to alumni who have demonstrated distinguished leadership and commitment to serving the community in which they live or work. 1. In which ways has the nominee impacted their community, and through which organization(s)? 2. Is the service conducted through volunteer work or his/her career? 3. How does the nominee embody the Bates values of service and civic responsibility? This award is presented to volunteers who have made substantial gifts of time and energy to the college within the year. 1. In which capacity has this nominee volunteered for Bates this past year? 2. How is s/he dedicated to engaging the Bates community with the college and committed to advancing Bates' mission? This is the highest alumni award of the college, and has been bestowed only 15 times. 1. When Bates students study the legacy of this person in 100 years, how will this alum have changed the world and how will they be remembered? 2. What other awards has this nominee received for their work? This award is given in recognition of Bates leaders whose work has touched countless Bates people and helped them become better professionals. 1. In which industry does this nominee work? 2. How has this nominee inspired others in the Bates community? 3. Is this person a mentor, have they provided internships, or hired Batesies? 4. Please share a story illustrating how the nominee has impacted the professional life of fellow alum(s). This award is presented to a young graduate (no more than 15 years out) for exceptional volunteer service to Bates. 3. Why do you believe the service is extraordinary and how will it have lasting impact? This award for extraordinary service to Bates is bestowed upon alumni (usually greater than 25 year from graduation) for truly distinguished service — both in quantity and quality. This award is bestowed to an alum for a single academic, artistic, or scientific achievement. 3. What other awards has this nominee received for their work?